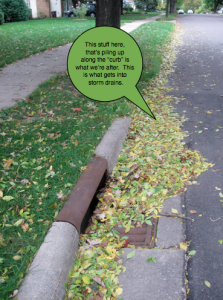 What is the "street gutter"
The purpose of the Como Curb Cleanup is to remove leaves from the “street gutter” which is the place where storm water flows down our streets. When leaves mix with storm water this is what causes phosphorus to leach out and then to flow into our storm sewers that drain to Como Lake and the Mississippi River. In this photo, the “street gutter” is the place where you can see leaves accumulating. You can also include a few of the leaves along the boulevard if you think these are likely to blow into the street. But our main desire is to get those leaves out of the path of flowing storm water! 2 Responses to What is the "street gutter"